JKap, John, Slasher and Apathy won the biggest event in Call of Duty history to take home $800,000 of the $2 million prize pool. After making it into the grand finals of the Call of Duty Championship for the third time in four years, Team EnVyUs was finally able to take home the elusive championship this year at Call of Duty XP in Black Ops III. In doing so, Jordan “JKap” Kaplan became only the second player in history to win two world championships after winning in 2015 with Denial Esports on Call of Duty: Advanced Warfare. Johnathon “John” Perez, Austin “Slasher” Liddicoat and Bryan “Apathy” Zhelyazkov are all first-time winners after placing well in CoD for numerous years on various teams. 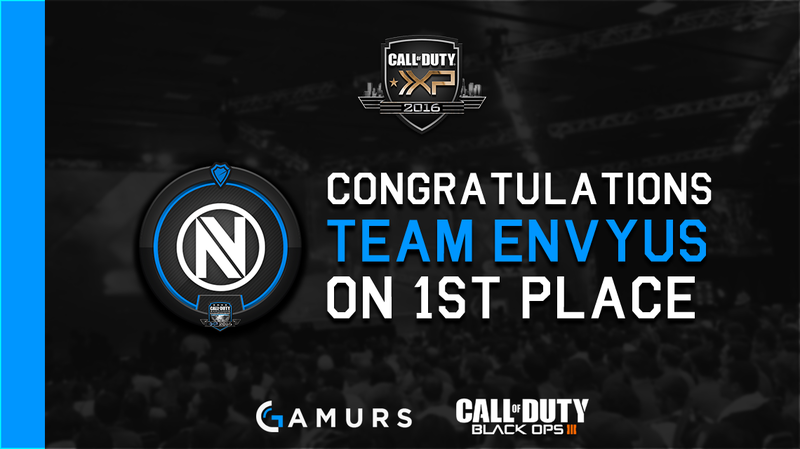 EnVyUs’s journey started with a close match in Group Play against Cloud9, but they came out on top 3-2. They would win Group G after 3-1 victories against Team Orbit and Vitality to earn a spot in the double-elimination bracket. The team’s first bracket match was a tough one against OpTic Gaming, but they prevailed with a 3-1 victory and the road to destiny had begun. On Saturday, they would handle FaZe Clan with a 3-0 sweep and earned a spot in the winners’ finals with a 3-1 victory over FAB. Sunday started off with a matchup Team against eLevate, and nV was up to the task again with a 3-1 victory to move on to the grand finals where they would meet up with EU team Splyce. In the first-ever NA vs. EU grand finals in Call of Duty Championship history, nV had their work cut out for them after failing to win Game 1 Hardpoint despite a huge early lead. Led by the slaying efforts of an all-around balanced and talented squad, however, they would bounce back to win the next three maps in strong fashion to win the series 3-1 and take home the title. John was named the MVP after a dominant performance. As the final seconds ticked off of the clock, team owner Mike “Hastr0” Rufail sprinted onto the stage to embrace JKap and lift him up into the air victoriously. It’s the first world championship in a long road for nV, a team that began in 2007. Hastr0 has since moved on to bring nV to other esports, but CoD is where its foundation began. Congratulations to Hastr0, JKap, John, Slasher and Apathy, the 2016 Call of Duty World League Champions.